Hey friends! First off, thank you to each and everyone of you who left sweet and encouraging words about our future addition, we can't wait to meet our sweet baby girl. In honor of the good news we wanted to share with you some nursery inspiration + decor, that have been fueling our future design plans. 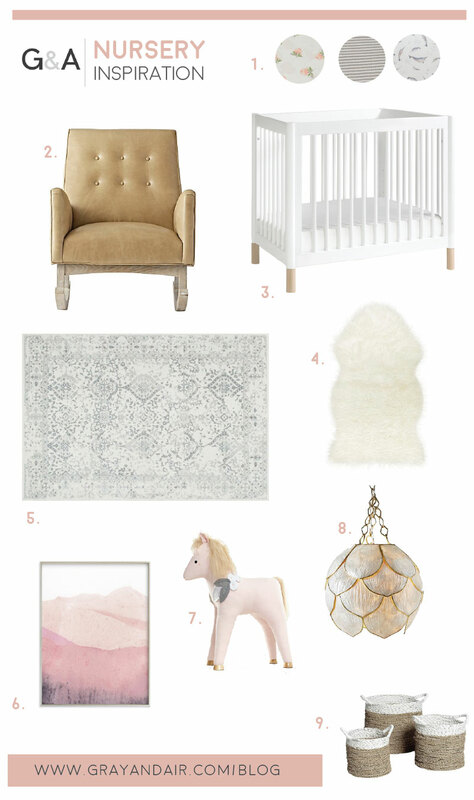 So here are 9 items I (Air) am currently obsessing over and hope to somehow incorporate in the nursery. Muslin Sheets- I am OBSESSED with the way this fabric feels. It is so light and airy and Little Unicorn makes the most adorable prints. My good friend Sam introduced me to this brand and I can't wait to buy a variety of the crib sheets to mix and match. :) Check out the three prints I am currently loving: HERE, HERE, and HERE. Rocking Chair- We definitley want to have a place to sit with our girl, whether it's in the middle of the night or right before nap time. Gray and I love the idea of a neutral chair that can grow with our family. This sandy leather rocker has a nice balance of modern structure with a timeless class. While we have haven't decided 100% on our chair of choice, this cutie is definitley in our top faves. Check it out HERE. Crib- One of the most essential components of a nursery is the crib. We want a neutral, modern crib with clean lines and the ability to grow with our girl. We love this particular crib and you will most likely see it in our nursery reveal. See it HERE. Sheepskin Rugs + Texture- Gray's family comes from New Zealand and it is extremely common for every baby to have their own sheepskin rug while they are little. Gray's Mom had one for each of her boys and I love the idea of having a soft, cozy rug for our baby too. Rug- In all of our bedrooms we have wood inspired tile, so a plush rug in the nursery is a must. I like the idea of having a muted pattern so that the rug can be used for a while, even if we change the room a bit. Rugs I like at the moment: HERE, HERE and HERE. Magical Elements- This unicorn seriously makes my heart skip a beat and while I want to have minimal decor, I also firmly believe in having fun soft toys and stuffed animals around for her to play with as she gets older. I would have LOVED this adorable unicorn growing up and I think it's something I will definitley be purchasing. See the whole collection by clicking HERE. Lighting- I really like the idea of removing the ceiling fan in the nursery and adding a really cool light fixture. I am loving this, this and this. Baskets- In an ideal world every toy, outfit and item will have a place where it is organized and belongs. I like the idea of using baskets as way to soften up the organization but also help create that boho vibe. Cute ones found HERE.